The original Tracer 900 was a great bike, a faired, more long-legged version of the brilliant MT-09 roadster, now for 2018 it's improved with revised bodywork and seating while this top spec GT version, with panniers, adjustable suspension and more is even better yet. A true do-it-all machine. Three-cylinder MT-09 underpinnings are lively and fun, updated Tracer comfort and practicality give true versatility while new GT trimmings (panniers, adjustable suspension, TFT screen, heated grips and more) add a real touch of class. The Tracer GT has it all - what's not to like? Interested in buying a Yamaha Tracer 900 GT? The original MT-09 Tracer, born out of the similarly-brilliant MT-09 three-cylinder roadster, was already a brilliant bike and a deserved best-seller, adding comfort and versatility to the value and fun-packed MT-09 roadster. For 2018, and now renamed simply the Tracer 900, it's better yet thanks to revised bodywork and ergonomics, longer, more stable swing arm and standard centre-stand. But this new GT version takes things even further with improved ride and equipment. In short, no longer an affordable, versatile fun bike, the Tracer GT is a true all-rounder that has it all, even if it still has a slightly bland, worthy image. There wasn't much wrong with the old one, being upright and comfortable but with enough 'attitude' to make every ride a thrill - but Yamaha has improved it anyway. 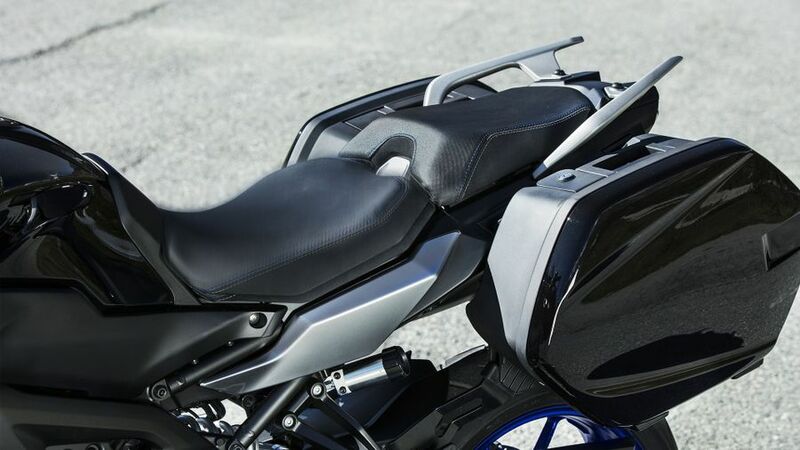 New bodywork gives better weather protection; revised ergonomics and a new seat and footpeg position improve comfort - especially for pillions - while the adjustable screen is now larger, too. Sure it's not as cavernous and cossetted as full bore adventure or touring bikes, but for a middleweight it wants for little. In short: for the money, bikes don't get much more practical. The standard Tracer was already hugely versatile, blending nimble, round-town manouvrability with long distance two-up comfort. 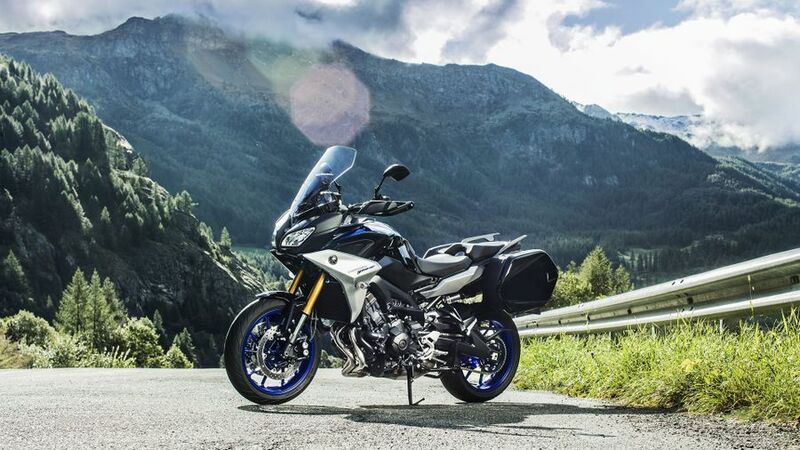 Now this new GT version, complete with the stocker's added centre-stand and adjustable screen but now also panniers and heated grips, makes it a true all-year-round do anything machine but also one at a price that far undercuts most rivals. What more would you want? 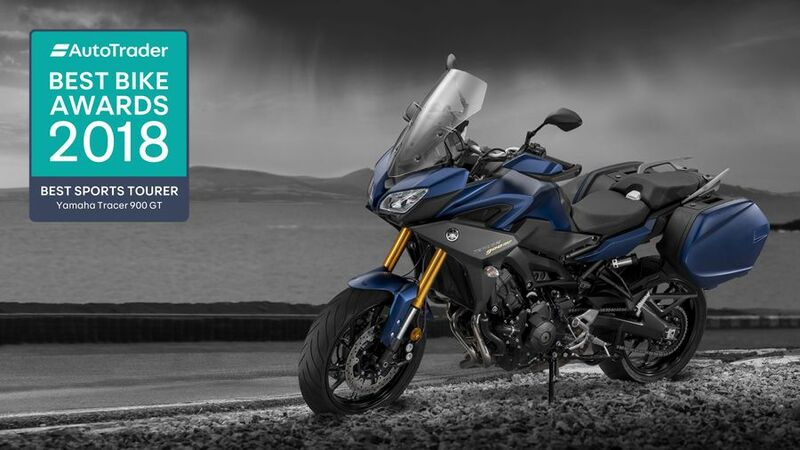 The original Tracer got off to a flying start by being based on the brilliantly lively-but-flexible MT-09, 847cc, 115bhp, three-cylinder engine - it's still one of biking's best engines in managing that rare trick of blending easy, flexible versatility with lively, punchy thrills - plus it's got character in spades. That's no different here in this latest GT guise, although the addition of a quick shifter certainly adds to the fun. 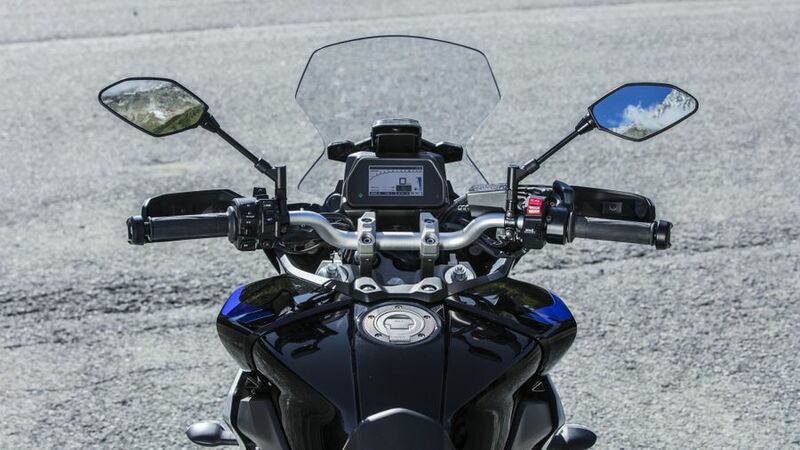 Braking, too, although unchanged from the MT-09's ABS-assisted twin discs with radially mounted calipers, might not be quite up the latest sports bikes are more than up to the job. No complaints. In this GT trim it's a significant improvement over the old. The old Tracer's forks were certainly less assured and the GT gets new, upgraded, multi-adjustable, KYB forks plus a remote preload adjuster at the rear. The result is a far more assured ride with the benefit of being able to fine-tune it to suit personal taste. 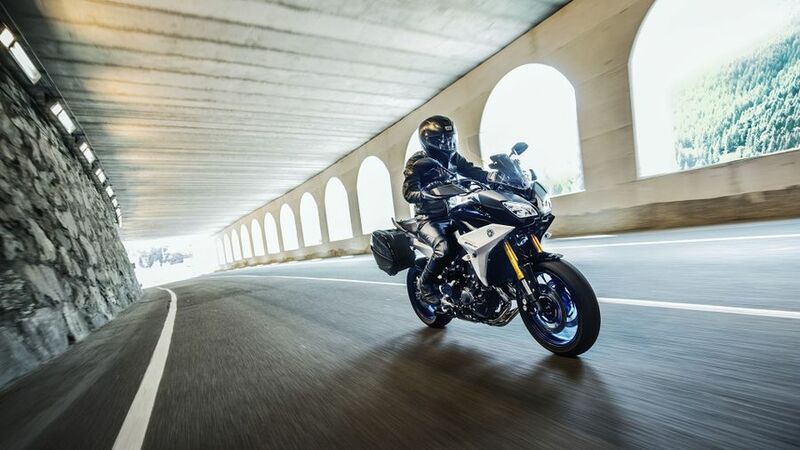 One further change to both new Tracers is a longer swingarm to add extra touring-style stability, which also adds to the all-round sense of planted assurance without noticeably compromising agility. It's easy to forget, especially in this high-spec GT trim, that the Tracer was originally built as an afterthought variant of a budget-orientated roadster - the MT-09. But in terms of running costs, on the whole that's a good thing. With 'just' 115bhp, its hunger for consumables such as tyres, fuel, chain, brake pads and so on is better than high-end, heavyweight 1200cc+ monsters, as is its insurance costs; being a hugely popular machine means residuals are better than most and it's reasonably value in the first place - but the cheaper, base Tracer 900, of course, is even better yet, as is the smaller 700 version. 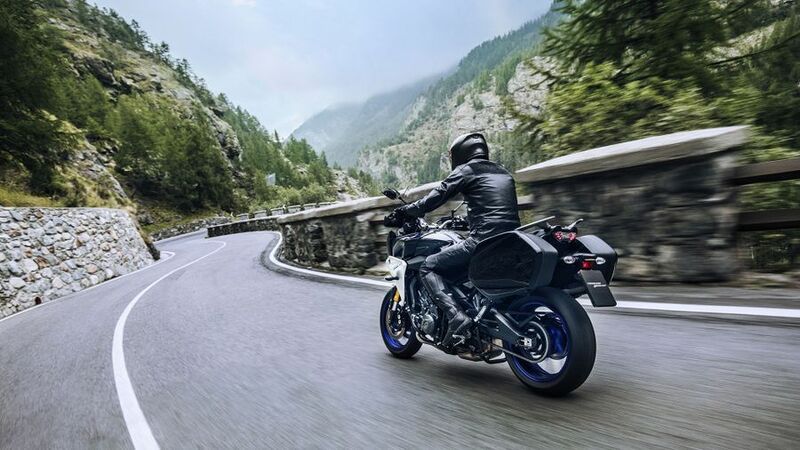 Yamaha's universally liked MT-09 platform has proved a stonker and been around for fours now, essentially unchanged, with no major mechanical concerns, so you should have nothing to worry about here. Chassis-wise it's pretty good, too, although being a (slightly) budget-orientated machine we'd recommend keeping an eye out for corrosion as Tracers often get used year-round in all conditions, many are high mileage workhorses and Yamaha's finish and fittings haven't always proved the best. Like most modern, mainstream machines from the major manufacturers, be they European or Japanese, the new Tracer GT comes with a standard, manufacturer backed, two year/unlimited mileage parts and labour warranty. So far, so normal. Servicing is standard Yamaha fare, too, with minor services every 6000 miles, major ones every 12,000 and a valve check every 24,000. Overall: not as good as some, but nothing to worry about, either. The GT is all about extra equipment, so while the standard 900 Tracer remains a little Spartan and built down to a price (albeit with all the basics in all the right places) the GT gets a fancy new full colour TFT screen, heated grips, panniers, fully adjustable suspension and even heated grips - in short, all the stuff we're more used to on high end adventure bikes or flagship tourers. And all for under £12K, too. With the new Tracer GT you really CAN have your cake and eat it. With the new Tracer GT it's more of a case of 'Why not?'. The base Tracer was already a great all-rounder that's invigorating, affordable and versatile - enough to fully justify it becoming a best seller. The new 2018 version is better yet, with improved ergonomics and spec while this GT version has a whole raft of useful extras all for an equally good price. The GT might not quite twang the heart strings as much as more expensive exotica or performance machines, but it ticks virtually every box and is an undeniably logical buy.